Biryani !! 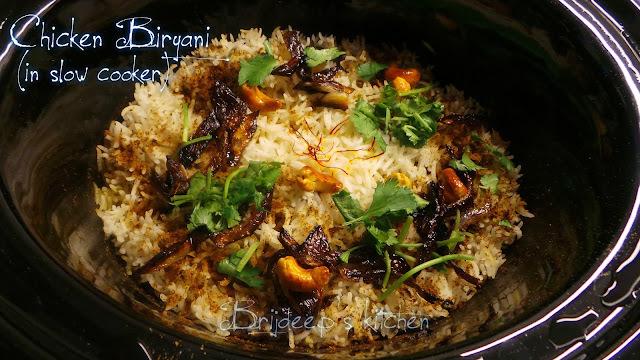 The mention of this dish always makes me drool and undoubtedly I can have a serving of biryani even with a full stomach. And I know nobody can resist a plate full of yummy biryani. 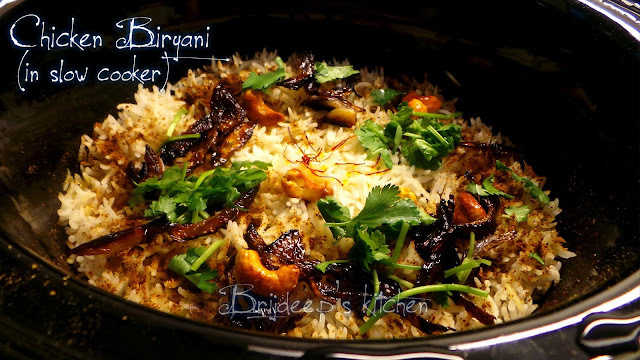 But whenever I think about preparing the same, I feel really tired by thinking the elaborate process involved in cooking of biryani and I can totally not prepare it, no matter how much I'm craving for it. I'm sure you know the feeling of craving something and then not being able to have it because you are too tired to prepare it and you know you won't get that awesome dish anywhere else. But now, you actually can! And without tiring yourself out and also without putting in much of an effort and time. 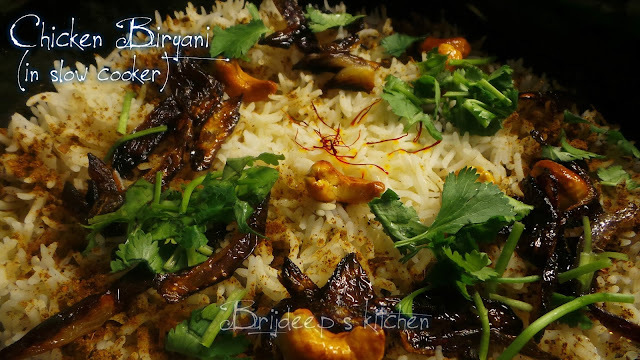 Believe me, we had this biryani on a weeknight dinner which was a working day, all because my slow cooker was putting in all the efforts to make this yummy biryani, bursting with flavors, while I was at work. It's so simple you could actually put in just 15 minutes of your time and can relish this dish any day. It requires some before hand preparation though, but 15 minutes, for a biryani, I'm sure that's not asking a lot. Wash and clean the chicken and marinate the chicken in marinating ingredients. Cover and refrigerate overnight or 8 hours. Take out the marinated chicken 30 minutes before you begin the preparation to bring it to room temperature. Turn on your slow cooker and add oil to it. Add the marinated chicken and mix it. Add the chopped onions, garlic, ginger, green chili and mix well. Add the salt and red chili, mix well. Add the dollop of butter and cover the slow cooker. Turn it on the low mode and leave for work. Let it cook slowly for about 8 hours. After 8 hours, add the chopped tomatoes and the yogurt. Mix well and cover again and turn on the mode to high. Boil rice: How to make the perfect boiled rice. Turn off the slow cooker. Take out all the contents in a big bowl. Now layer the rice at the base of slow cooker bowl and then a layer of chicken. Add another layer of rice and sprinkle the mint leaves. Add the remaining chicken and cover it with another layer of rice. Sprinkle the biryani masala over this rice layer. Add the saffron strands and sprinkle the milk. Cover the slow cooker and turn on again on slow mode. Leave for an hour. Heat oil in a deep bottomed pan and fry the sliced onions until they are brown and crisp. Toast the cashews in the same oil. 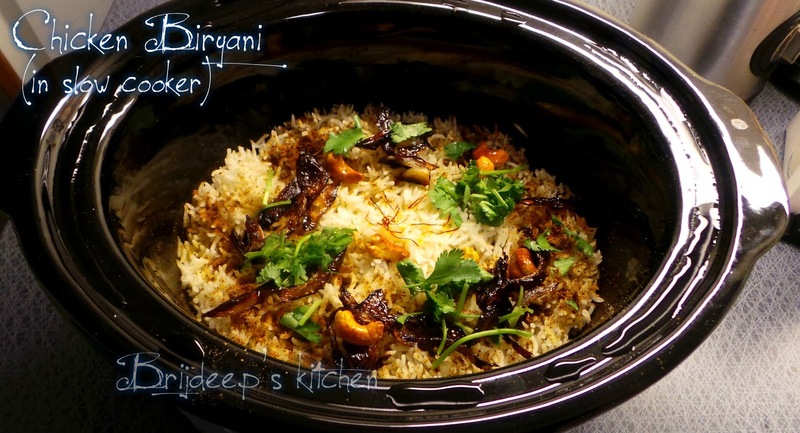 Open the slow cooker, add the sliced onions and cashews, garnish with fresh coriander leaves and serve hot !! Loved this recipe? Do leave your valuable comments/feedback in the comment section below and don't forget to subscribe via Facebook for regular yummilicious updates! Marinating for 8 hours is ok but cooking for 8 hours are you sure. Its in the slow cooker....hence 8hrs. yes because it's in slow cooker..
yes marinating for 8 hours than keep in slow cooker it will cook itself slowly for 8 hours you don't need to do anything.. yes I'm sure.. In the masala part you also have oil, garam masala and kasoori methi? When do you add that?